gorgeous flowers Dr.sonia........it'll surely make ur new home look lovely n beautiful. Thanks for the tute. BTW i did teach dis foam rose to kids in a kid-friendly way without glue gun (used toothpick) & we used circle shapes for the petal. But urs is way far gorgeous Dr. Sonia. Gorgeous roses Sonia,and a fabulous tutorial..I used to make roses out of icing, so should manage foam..they look beautiful in the vase with the white flowers..Gorgeous. Chrissy you will rock with foam and its not as tricky as fondant or marzipan as its so easy to mould and shape!! Wow Sonia these roses are beautiful! ! The tutorial is wonderful! Thanks so much for sharing! Thank you so much Shraddha..I had a tough time photographing for the tutorial due to rains and cloudy skies!! Thank you so much Sasha..I am a big fan of your cards! These are beautiful. Look just like the real thing. Your tutorials are so clear and informative. Hugs Mrs A. Thank you Jessica..off to visit you ..
thanks you doc. for such a nice tute .its really very helpfull and your bouquet is beautiful. Thank you Megha you are always so appreciative of my tutes...thank you!!! Beautiful roses, I also love the white flowers! Gorgeous flowers. They really look real. Thanks for the tutorial. Would LOVE to have you come and link these up over at 2 Creative Chicks 3D challenge. Thanks for the detailed step by step. This makes it easy to run! I am happy with your return! Thank you so much Nagela it is so good to have old friends drop in! Lovely bouquet with your sola wood flower and foam roses. Your tuts are always so easy to follow. A lovely bouquet of roses for all seasons !! WOnderful tutorial as always and I loved the solawood flowers too,looking forward to the tutorial. Everything is coming up Roses & bee-utiful ones at that. I'm still getting use to using a glue gun. I slightly burnt one of my fingers awhile ago. Thank you Melissa yes when I rush things I do tend to burn myself too!! 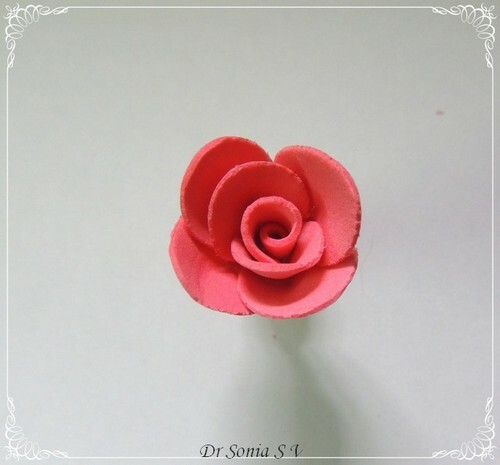 Sindhu I find flower making ideal for crafting in short snatches of time! Gorgeous and pretty as usual . your bouquet looks so natural, Sonia!! waiting now for the sola wood tute!! Thank you Hema..I have a tutorial for sola wood roses ..the one shown above is super easy! Those are amazing! You are such an artist!!! Thanks for stopping by my blog and saying hi. I have been a bit remiss in visiting my favorite blogs. ;) Hope all is well with you! Thank you Bipasha..I have almost run out of sola wood so will bug you to know where you got your stock from! Thank you so much Helen. A comment from you always brightens my day! Ha Ha thank you Pritesh and yes I do have some beautiful roses in my garden too!! Penny I made the flowers in batches so I didnt feel they took up a lot of time...the tutorial photos however did take a lot of time!! Thank you Doris..I fell in love with your blog when I landed there yesterday!! They are indeed rather easy Ann!! These look super real, Sonia!! Well done. Just stunning! Who needs the real thing (LOL). Thank you for sharing your fab tutorial. Ha Ha so true Michaela..I hate to pluck a real rose as it withers away soon!! 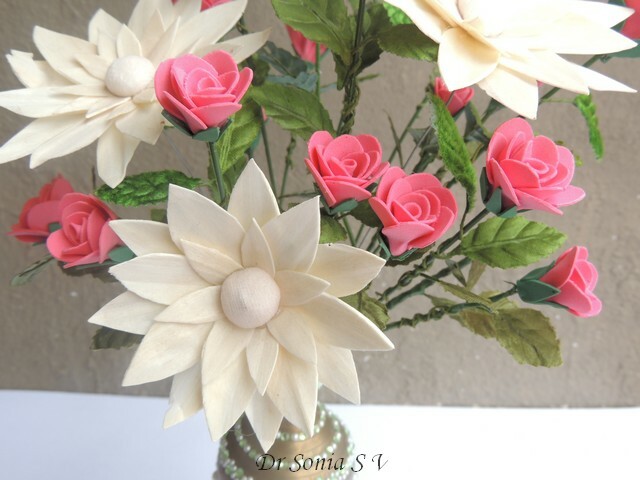 Wow Sonia, I believe this may be the best yet of your creations... love them both, especially those white flowers... Beautifully done! Thank you so much Shirl..ha ha I added the sola wood flowers as an after thought and everybody seems to love them!! I am always in awe of your projects- and have never seen foam flowers this beautiful!!! Oh thank you so much Shelly that is indeed so heart warming to hear! 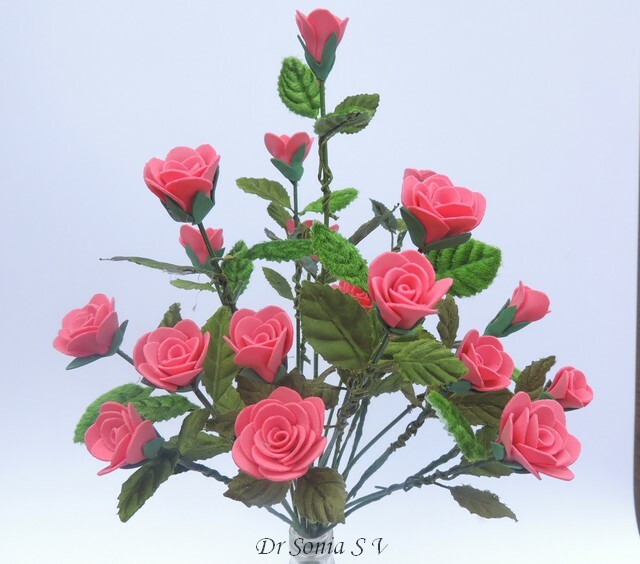 Your roses look very lovely and fresh.....thanks for the detailed instruction.Roses can be very very addictive,even after making so many of them I still cannot stop. Ha Ha yes indeed they are..I have to find projects to use up my flowers now!! Oh WOW This is a totally amazing creation and For more than a moment I thought they were real. Thank you so much for sharing. Oooh Chris that is the best compliment!! Thank you!! wow..another gogeous creation....now u r truly back in form.....lol....loved the foam roses n those sola wood blooms....beautiful.....but can u pls share the thickness of foam sheet u hv used in these roses n also in those foam cala lilies...n this sola wood is known by which name in local markets...thanks for sharing all your creations with us in so well explained manner. 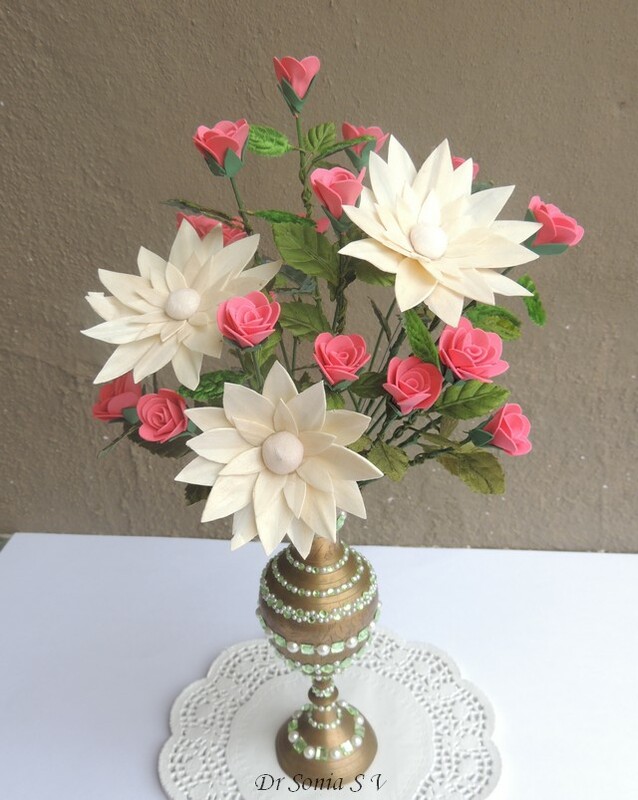 Shalu I have seen thick type of foam at Itsy Bitsy which is more expensive and good for stand alone flowers but not too easy to make roses with. I got the thin type from a local super market by some Chinese company so no mention of millimeter thickness is there. Any type of foam you see do buy it if an A 4 sheet works out for 10 or less rupees.I have seen big rolls of the foam sheets in a local Bangalore market called Raja market too but they had limited colors. Shalu sola wood is ethnic to India as its made from tapioca peel.It is called sola wood only.Try your local fancy shop which sells flower making supplies. Sola wood crafts were supposedly popular in crafting circles in India some time back and later fell into oblivion. I picked up a roll from Itsy Bitsy but they no longer have it. Thank you Hussena sola wood is very delicate so it was tricky making those huge flowers!! 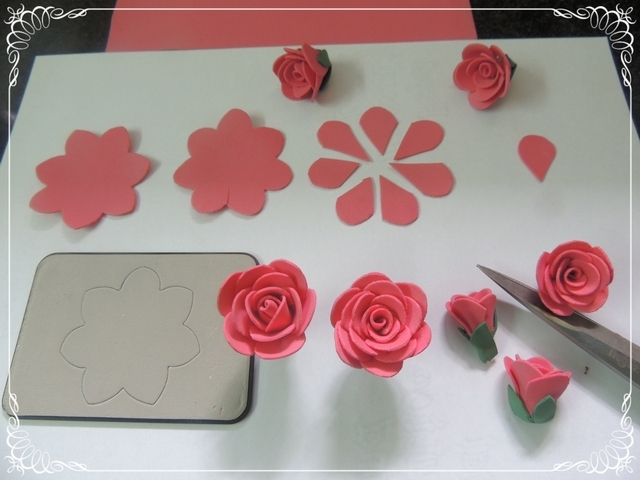 Deine Rosen sind wunderschön und vielen Dank, für den Tutorial!!! Das muss ich wieder ausprobieren. 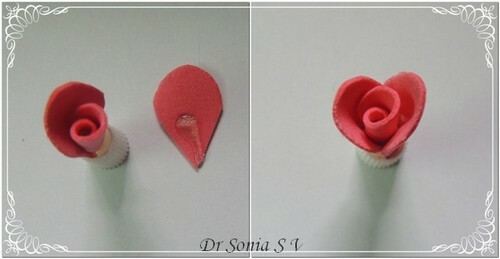 super fantabulous flowers Dr Sonia ..wanna try them out .. you are expert in foam flowers.. u made thm easy with ur tutorial. thank u for sharing. 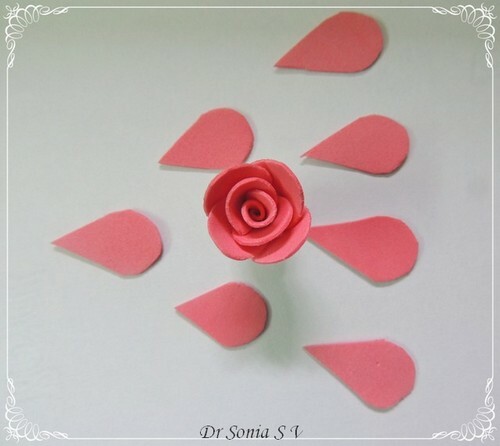 This tutorial is awesome Dr.Sonia! The roses looks splendid. Thank you so much for the tute. Would love to see yours Sharada. Thank you so much for dropping by! Wow, you are so creative. These flowers look so realistic. Selma!!!! So thrilled you like my flowers....I drool over almost all the flowers you make! 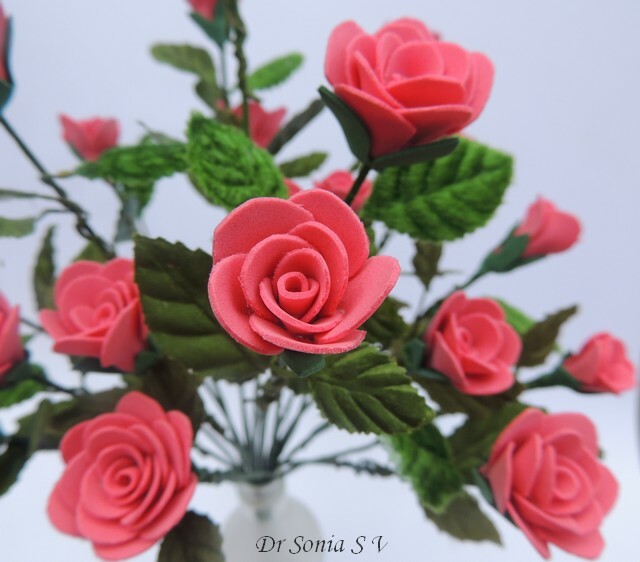 Dr, Sonia, your roses look so realistic and beautiful you did a wonderful job! Thank you for sharing your detailed tutorial! Really eye catching. The way you are explaining each post is awesome.. Really I'm going to try the foam flowers when I get time. Thank you so much Raji..I love to share my successful experiments hoping it will be of use to someone!! Thank you so much Loz..I enjoyed making the roses so much it didnt feel like a lot of work!! awesome !!! How did u click and make the rose at the same time :) I have been trying to do a video but never works out ! Pooja the hot glue would dry by the time I took the photo so I had to apply glue again to actually make the flower.Ha Ha and you are right tutorials are hard work!! Hello Dr. Tutorial is awesome as always and stepwise pictures step makes it understand so easy. 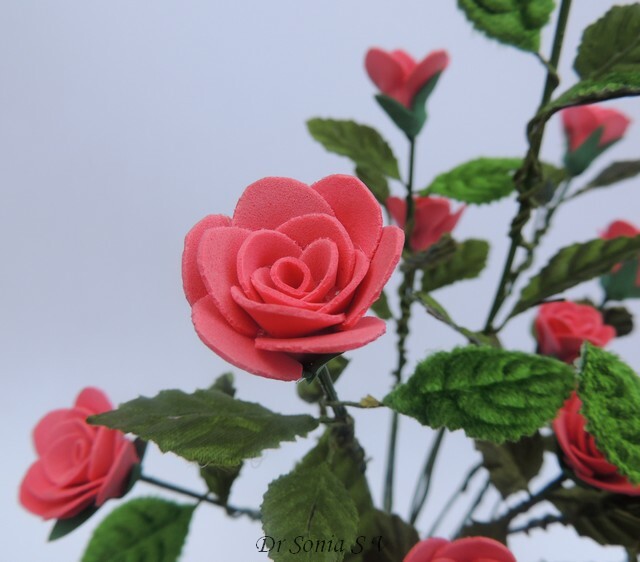 I locally bought these foam roses but never thought of making them.Now will try it out. Recently I made tutorial as part of my DT posts and I realized how difficult it is to take pics while working and that too of every single step. Hats off to you do Dr. You totally rocks with your tutorial. Oh yes Poornima..taking photos for tutorials is very time consuming and when its for small things such as flowers..focussing itself takes a good chunk!! But I guess my readers have come to expect tutorials from me and I feel I cant let them down.For the very few posts in which I dont post a tutorial..I invariably get lot of tutorial requests!! Dr. Sonia- you are so amazing! This is perfect and I love that you added the print button! This is very cool! you rock! Oh thank you so much Helen..the print button is just something I played with!! Pallavi I got the sola wood in rolls from Itsy Bitsy bangalore branch quite some time back but I dont think they have it online.Do try in local fancy stores as I think it is a popular craft with Indian ladies as its made from tapioca peel ethnic to India after all !!! Oh my word Sonia, these are positively stunning! You're so clever with these kinds of projects. Would never have imagined the potential of that die, I have the same one! Thanks so much for playing along ItsyBitsy's Sizzix Tutorial Challenge. All the very best! Thank you so much Sunehra..ha ha I am a bit crazy in such things..eg using the baloon punch I have created all kinds of flowers but not baloons!! 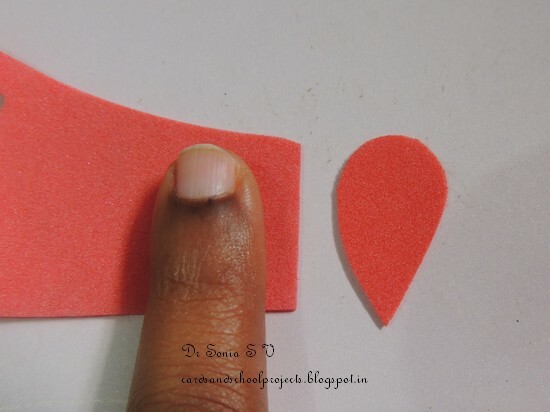 Foam has so much potential I just love it.Unlike paper it is sturdy and can be cleaned too! these look awesome Sonia. Its been quite a while since I bought foam sheets and didnt know that they came in pink. The whole arrangement looks really professional. Where did you get sola wood sheets from? Divya you get foam in all kinds of colors . I picked up sola wood from Itsy Bitsy months back but I am not sure they stock it now.Try local fancy stores.Since sola wood is ethnic to India being made from tapioca peels..I think you should be able to source it locally. love it:) didnt know foam sheets came in pink. btw where did you get sola wood from? My name is Rogério Toledo, and am starting a Blog cahamado http://artesanatoviabrasil.blogspot.com.br/, which I intend to put all kinds of craft work from my country and also people who love handicrafts in any anywhere in the world. I found many interesting articles on your blog and would traduzi'los and adapts them for my readers, that is if you allow me. is clear that the credits estaram on your behalf. but I need your permission. I did a test and not yet published, because I'm still creating various items for only then put online. If you liked it and let me disclose, want to be your companion at work here in Brazil, so we can disclose one another's work. Enjoy this link and agree. Otherwise I take the blog ok! Thank you for asking me. I am ok if you post one pic with link to my blog but I am not okay with posting of the whole blog post!! Hope you understand. Ok! thank you very much and certainly do so by sending the direct link to your blog. But believe me (laughs) My Country is well lazy to read blog in another language, so I asked the translation and put the original site and links throughout the project. But I understand and will abide by your wish. Thank you for authorization. Roses are beautiful...wonderful tutorial! Thanks for sharing. Thank you Hema. And yes I will post the sola wood flower tutorial it soon!! I remember sola wood from my school days!! this is simply superb! 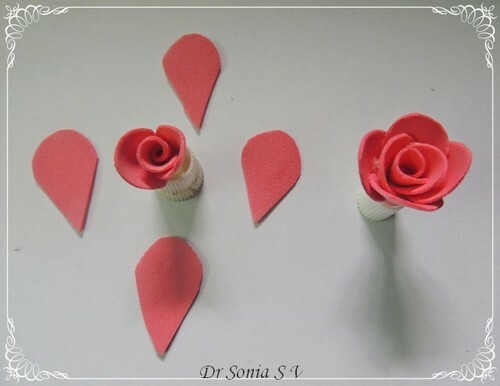 hi,these roses are too cute.i have made some flowers with foam too and uploaded on my blog mugdhagujarathi.blogspot.com..would love to hear your suggestions.. I got inspired by your tutorial and tried to make red foam flowers for one of my project. It turned out pretty well and am going to make a whole bouquet of foam roses. Thank you Sonia. Am so thrilled to hear it Ramya...do leave a link when you share the photo.It feels so good when my tutorials are put to use!! Thrilled to see you linked to my tutorial and that it was so useful to you!! Your roses are absolutely brilliant with a fabulous tutorial. Love them. Wow ! what a wonderful collections ...suuuuuuuper..
Is this a foam or foamiran? Foamiran is a brand of foam. 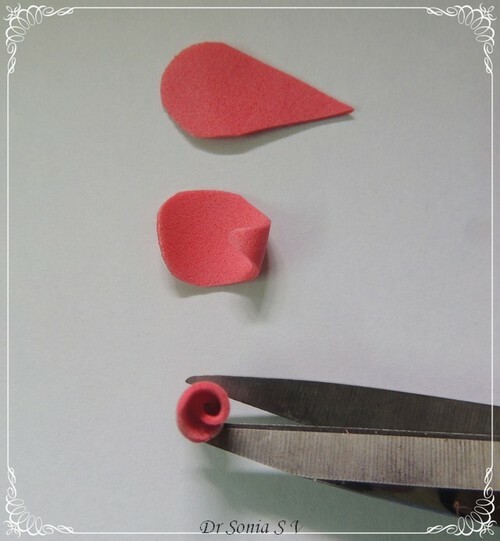 I made this foam flower long before branded foam became popular! Great tutorial, Sonia. Thank you so much for sharing, my friend.